How do you measure enterprise IT? How to visualize the metrics and the business benefits of the software and apps in your organization? Which Apps are open source or outdated? We will answer these questions here, briefly. 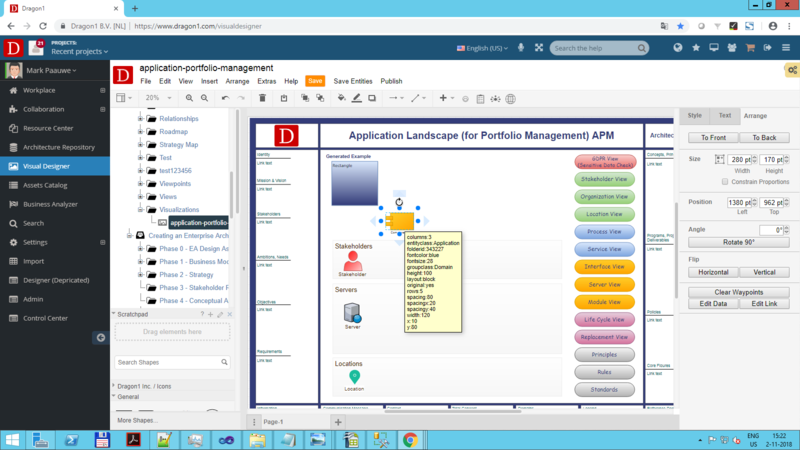 We will show step by step with screenshots how you can create an application landscape for portfolio management on the Dragon1 Platform. But first, what is APM? 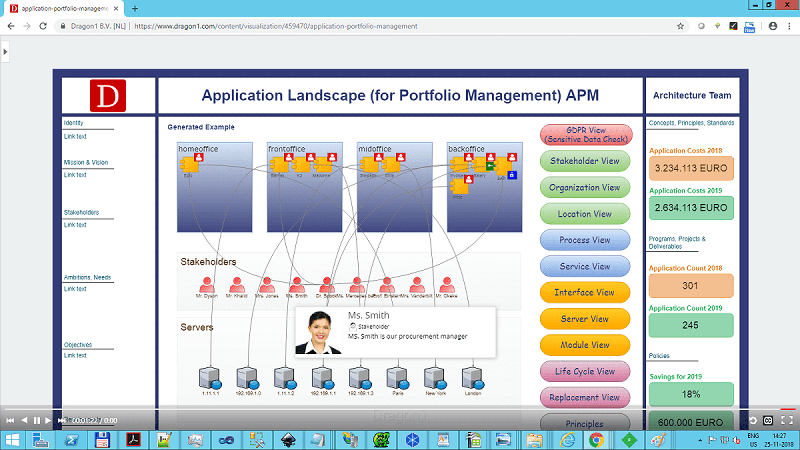 APM or Application Portfolio Management is a practice that emerged in companies with a mid to large-size information technology organizations since the 1990s. Application portfolio management (APM) is a framework for managing enterprise IT software applications and software-based services. APM provides managers with an inventory of the company's software applications and metrics to illustrate the business benefits of each application. How To Create An Application Landscape on Dragon1? 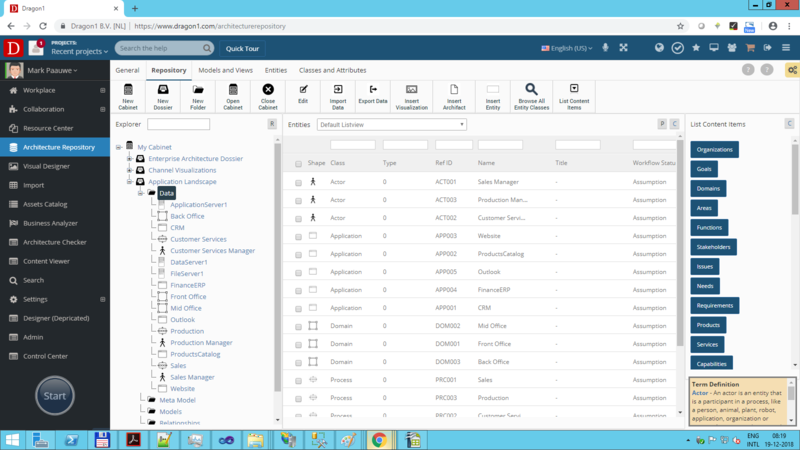 We will show you in a few steps how to create an application landscape that can be used for portfolio management, meaning you can measure and manage the applications and show and improve their value for the business,. 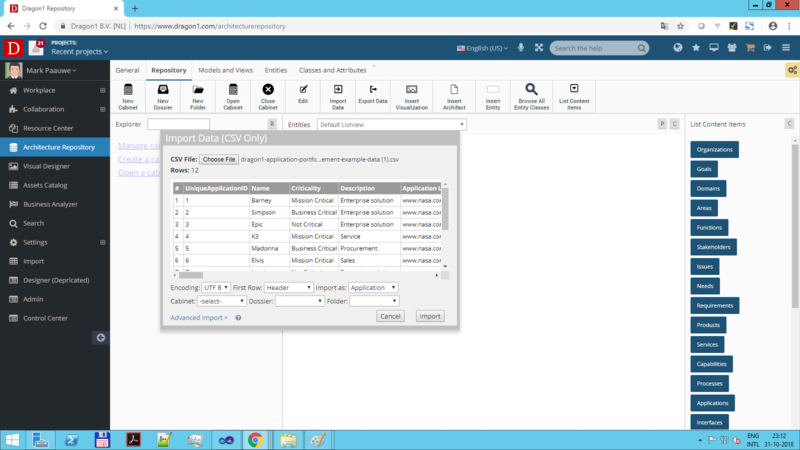 Here you can download an example CSV file that is often used as basis to create an import file. Screenshot of the example data that can be used. In the screenshot below you see how you can import a csv file in the Architecture Repository. 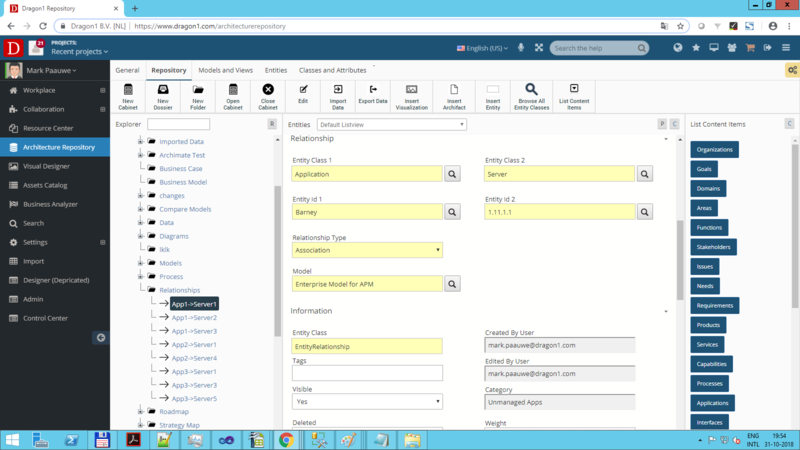 Screenshot of the import feature in the Architecture Repository application. 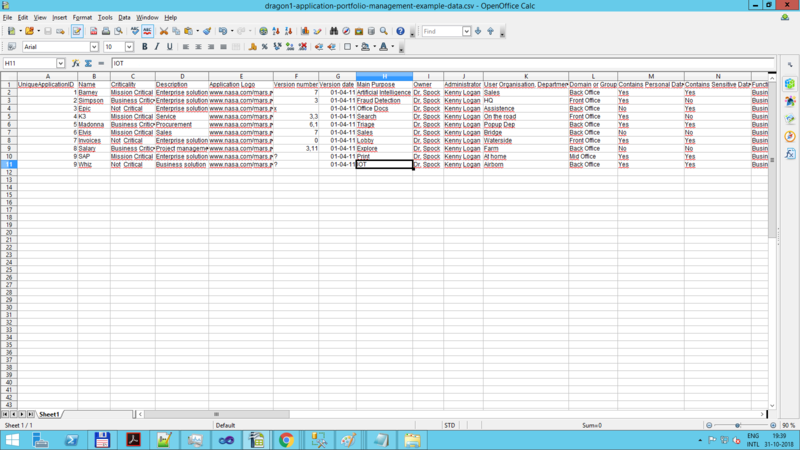 Screenshot of the imported data in the Architecture Repository application. To keep this example easy and understandable we work with 10 applications only. In practice you can easily place 200 applications, with 30+ attributes per application, on one visualization. Suppose the imported data is a list of applications, then in the column relationships and servers there might be an enumerated list of values. Dragon1 uses these values to generate relationships. In the screenshot below you see relationships (associations) generated for applications and servers. Screenshot of a relationship between an application and a server. 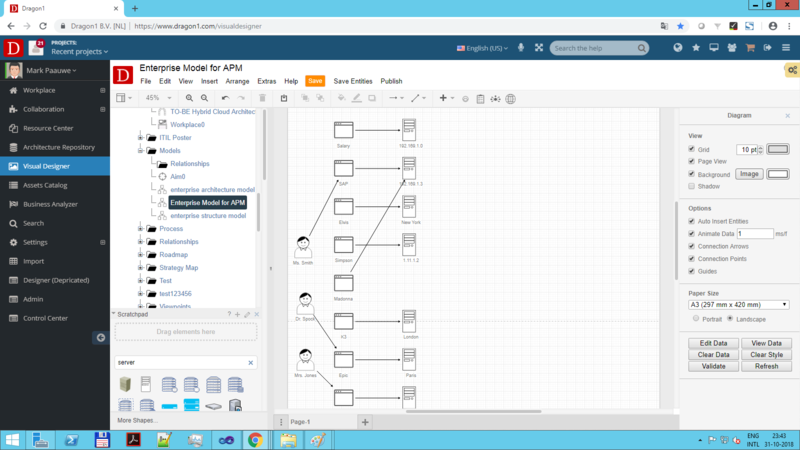 If you go to the Visual Designer, open the cabinet and click on the model, a model will be generated showing visually the relationships between the applications and servers. 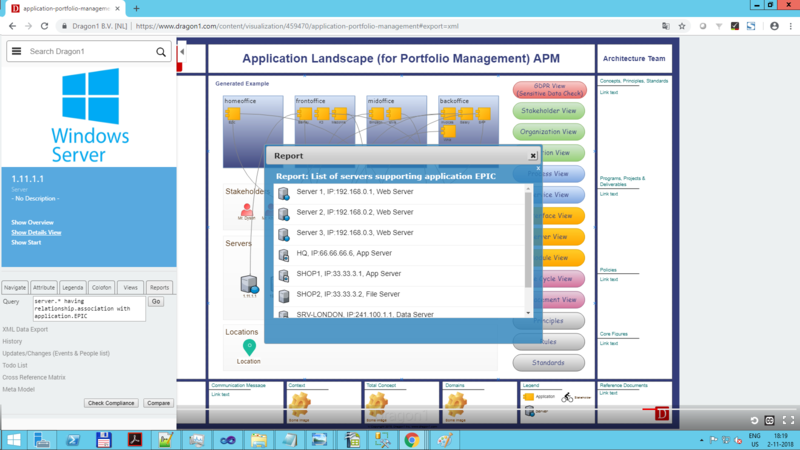 Screenshot of a model showing relationships between domains, applications and servers. If create many relationships for many entities, the model will contain information that is not of interest to everyone. Therefore we create views (filters) on the model. And we link the views to button on the visualization so that when one clicks on the button, a specific view that is of interest to a stakeholder is shown. Below you see an example view created. You can try that view in the live application landscape at the top of the screen. On Dragon1 you can create visualization templates. A template is a drawing canvas that contains visual items. A visual item is a shape that is configured to show data from a source like a view, model or folder in a cabinet. Below you see three visual items configured and placed on a canvas. We have clicked on one of the visual items so the configuration is shown. The rectangle for the domain is used to group the applications. You can choose whatever entity-class or attribute you want for grouping. Screenshot of a visualization template with visual items for data aware shapes and buttons for views. You can place buttons on a visualization that check the attribute value of entities and show icons with tooltips accordingly. Below you see an example of a GDPR button, turning a visualization into a management tool. Screenshot of a configured button on a visualization template. When you click on the View Data button in the Visual Designer or you watch the visualization in the content viewer (as stakeholder) you visual items form the template are interpreted and the visualization is generated. Now you can click on the button and leave comments and search for values of attributes in the visualization. Below you see the result when you click on the red GDPR View button. Per application a icon is shown indicating whether or not sensitive data is stored, read or updated. Below you see an example where is searched for the attribute Owner. 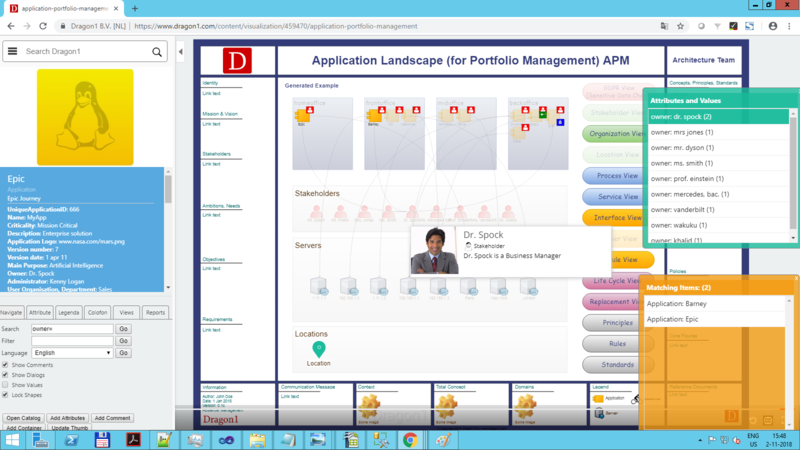 The visualization show that Dr. Spock is owner of the applications EPIC and BARNEY. Next the user clicked on the application EPIC. In the bar on the left the details of that application are shown. Which applications are not compliant to a certain standard? For which applications do we use more license than we bought? Which applications should already have been replaced because of outdated technology? Which applications should be abandoned because they do not add value to the business? Can I replace a certain application and what is the impact of that change?